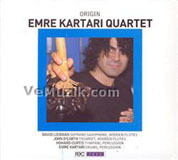 A line-up featuring two horns (saxophone and trumpet), and two percussionists (tympani and drum kit) might seem an odd choice, but for Turkish drummer Emre Kartari it's simply a different means to a very musical end. Make no mistake: while there's plenty of free play on Origin, it's based around conceptual sketches, written by Kartari, that provide his group with a series of different contexts that are surprisingly varied and unexpectedly complete. There are plenty of chord-avoidant groups out there, but they often have something holding down the bottom end, and in this case it is tympanist Howard Curtis. Like Kartari, Curtis also plays a variety of percussion instruments, but it's his tuned tympanis that sometimes provide an underpinning, though in ways far from the norm. Meanwhile, trumpeter John D'Earth and soprano saxophonist David Liebmanwho both also play wooden flutes on tracks including the gentle "Welcome Piece provide Karatari with melodic, harmonic and interpretive foils, comfortably traversing territory ranging from the surprisingly beautiful yet often slightly dissonant "Free Ballad to the more extreme but undeniably structured "Dirty and New. There's considerable implication to be found, often in place of explicit direction, and in many cases it's possible to envision Kartari's material in a more conventional context. While Kartari, a dynamic player who can turn from creating spare textures to pulsing rhythms on a dime, provides plenty of forward motion throughout, he's also a powerfully responsive player. It is, in fact, the communicative skills of all four players that ultimately draw one into Origin; once over the surprise of this unorthodox line-up, there's a sense of logic and inevitability that begins to unfold. The improvisation on Origin is clearly collective; while an individual voice, like Liebman's unmistakable soprano, might dominate at times, more often than not the four voices are interacting, as they do on the title track where Liebman and D'Earth seem to orbit around each other, magically coalescing on occasion for melodies that are sometimes scored, other times drawn from the ether. The music ranges from turbulence ("Istanbul ) to ethereal ("Anadolu ), and from near-cinematic ("Hitchcock Scene ) to near-funk ("City Groove ). Throughout, Kartari, Curtis, D'Earth and Liebman give the writing surprising shape and a group sound that you'd be hard-pressed to find anywhere else. Origin is an album that may seem hard to approach at first, but those with open ears and open minds will welcome this strange confluence of instruments, and be rewarded with an hour of music that continues to engage the head and heart long after it's over. Track Listing: Welcome Piece; Above the Ocean; Free Ballad; Dirty and New; Origin; Anadolu; Istanbul; Hitchcock Scene; Trio; City Groove; Conclusion.